When someone goes for buying a fully functioning sedan in Pakistan, they usually tend to choose from Toyota or Honda. 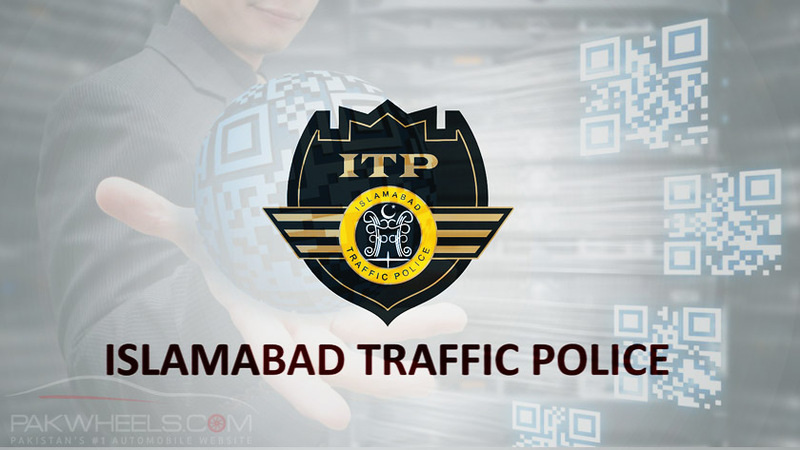 The sedan sector is dominated by the latest Corolla Altis and Civic lineup in Pakistan, and any new entrant will have to deliver something extraordinary in order to compete with these two. But not everyone can shell out 2.5-3.0 million Pkr for a brand new latest Honda Civic or a new Corolla Altis Grande but still want something more than standard Honda City or Toyota Corolla Gli. 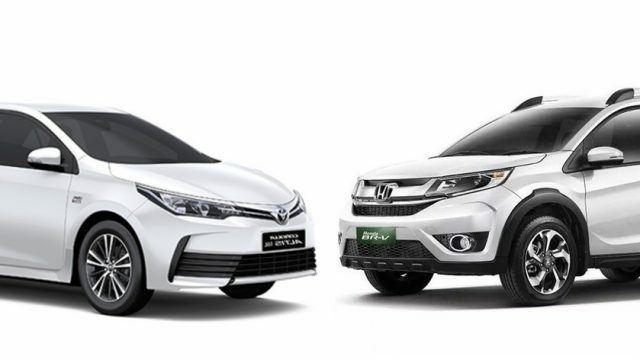 Here comes the Corolla Altis 1.6 and Honda BR-V. Although they do not belong to the same category but are roughly in the same price bracket. 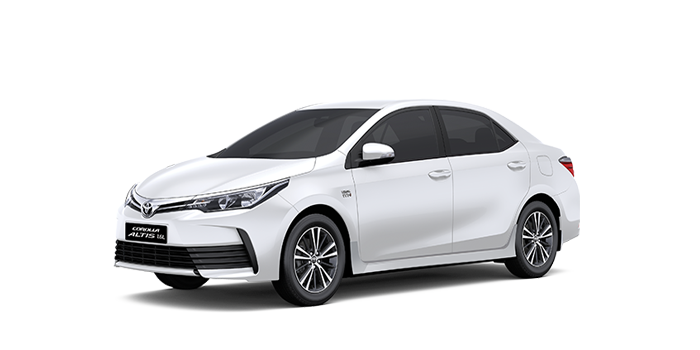 Toyota Corolla Altis 1.6 is priced at Pkr. 2,199,000/-ex-factory and Honda BR-V i-Vtec-S at 2,329,000/-ex-factory. The exterior of the Altis is pretty dynamic, prestige-boasting and iconic. Even with simple halogen headlamps instead of those Bi-beam LED in the Altis Grande, and a partial chrome grill it still looks sleek and stylish because of the new keen design of Toyota models. The slanting plastic inserts in the bumpers resemble closely to functional air vents, though they are not but still give a modern look to the car. BR-V, on the other hand, has a huge and bulky looking front end. A larger bumper with simple circular inserts for fog lamps but the massive chrome grill in line with the projection headlamps elevates the front of the car pretty well. The sides of both the cars are pretty normal. 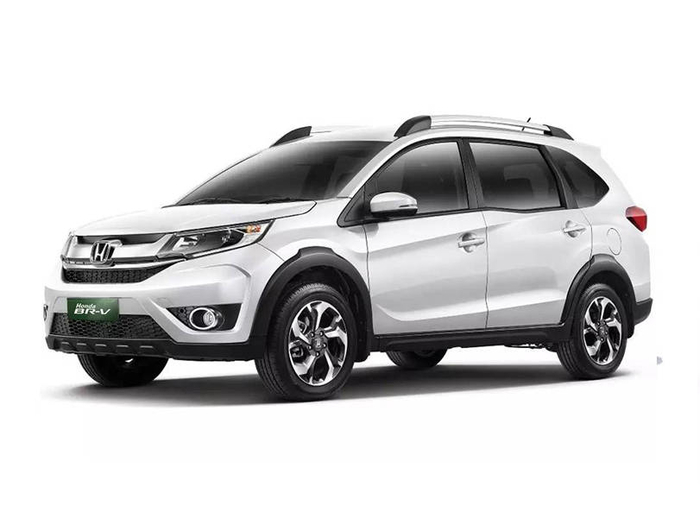 The only noticeable difference is the roof rails on the BR-V and chrome door handle. 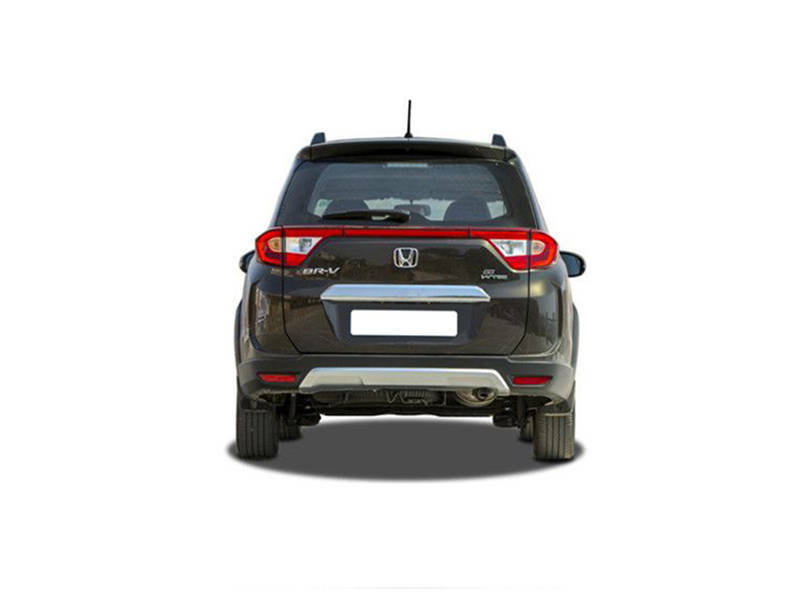 Honda BR-V being a small SUV has a flat back or a hatch in the rear instead of a trunk. There is a small chrome grill which flows in line to both the tail-lights. The back end of the car is pretty dull and boring, and nothing special is going on there. Altis has a trunk instead of a hatch and the same partial chrome grill running in line with the tail lights. After the facelift, the new tail-lights give a pretty decent and mature look to the car. Both cars come with dual tone alloy wheels, instead of boring and dull single tone silver alloy wheels, both cars come equipped with stylish 16” inch dual-tone alloys which elevate the look of the car. Both cars seriously lack in interior styling. Both have a dual tone, beige and black interior with nothing much going on there. The navigation panel of the Altis looks better finished in piano black, but the premium feel is destroyed by the simple rotary ac knobs while BR-V has a climate control panel which looks way better but a dull has a dull design of the complete navigation panel. Altis has dual sided steering wheel controls for multimedia as well as i-mid controls. BR-V has only single sided multimedia controls and lacks a digital speedometer. 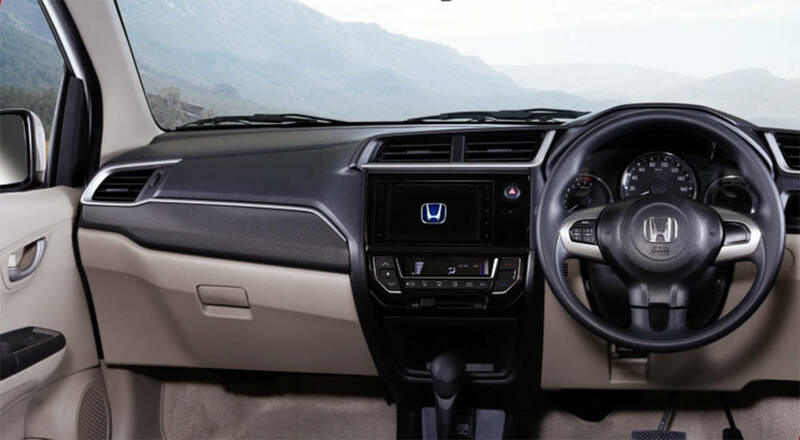 Altis comes with simple fabric seats while BR-V is equipped with leather seats. Now dimensions wise BR-V is a slightly bigger car meaning that it would be more practical and spacious car out of the two? Sadly, that is not the case here. Despite the smaller footprint, BR-V has a slightly bigger boot for carrying luggage after folding 3rd-row seats, but 2nd and 3rd seats feel way too cramped as compared to Altis 1.6 whose seats feel more comfortable. BR-V has one additional feature that is the read AC vents which Altis owners will miss out on. Other than that, both cars have a pretty basic interior, but Altis 1.6 takes the lead in interior styling. BR-V has a 1497cc internal combustion engine producing 118hp equipped with a CVT transmission. Altis 1.6 comes with a 1598cc internal combustion engine generating 120hp equipped with a simple 4-speed Automatic transmission. Over here BR-V takes the lead with its CVT which gives smooth shifting. BR-V and Altis 1.6 are from two different categories of cars. BR-V is a 7-seater compact SUV while Altis 1.6 is a full functioning sedan. Both cars cater the needs of different types of people. 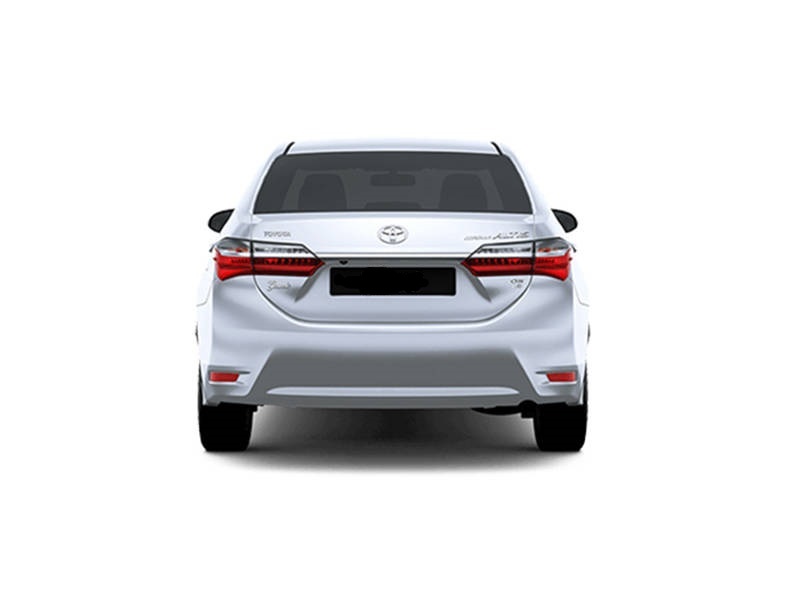 If you want a 7-seater car for city use, then BR-V would be the route to go, but if seven seats are not a requirement for you, the Altis 1.6 is better having a sturdier and strong suspension. In the end, it all depends on personal preferences. Let us know in the comments below which would you choose. Honda BRV is local assembled or imported??? Brv didn’t had a climate control, they just put an lcd panel insted of those knobs. But internal structure remain same. It is locally assembled with parts coming from Indonesia! I own a BRV and I will drop an honest owners review here. I have a family of 6, so our options were limited since we didnt want to cram inside a 5 seater car, which usually fits 4 comfortably. Thats one of the reason we had to cancel out a corolla grande and a civic, although they had impressive outlooks. Now lets not forget about the OWN money the showroom takes if you want the car on cash and on the spot. Otherwise the car would be given to you in 3 months if not paid. Toyota and Honda both asked for 2 lakhs and 2 lakh 50k, respectively for their grande and civic. Taking that into account the own for BRV was told to be 50k only. Which was further reduced to 20k without asking for reduction, as I was talking to the manager directly. BRV feul economy isn’t that good, I get in city of 9.5km and highways of 13/14km. Also note that I always use the car at its max. So yes thats fine. What most people dont know, is that the noise in cabin is merely nothing to be worried of as , A CVT means there are no gear shifts, so basically when you push the race, the car will move towards its max rev thats why there is sound of the engine. It’s a common issue with CVT engine. I own couple of luxury cars in dubai with CVT and have noticed the same. Notice, when you leave the pedal the sound goes, its only their when accelerating. The acceleration is fine and gets even better when the car is put in S mode. Although the car is not meant for racing but definitely a good feel to it. You never feel out of power when going from 0-100. PS. Almost 4 months of using the BRV and what can I say I kind of race with it. Not a single day I have drove it with care or without tail gating. BR-V is a CUV, not SUV.